Prizzi's Honor 1985 - 130 min. - Color Genre: Comedy Rated R Country: USA LaserDisc Movie Storyline: Black comedy about a thick hitman who falls for a woman who turns out to be in the same business. The romance hits a snag when "The Boss" hires each to rub out the other. 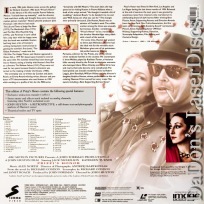 LaserDisc Movie Review: Richard Condon's delicious black comedy was lovingly translated to the screen by legendary director John Huston in one of his last movies. The Prizzis are a powerful family of mobsters, as devoted to their code of honor as they are to bending laws and breaking skulls. Charley Partanna (Jack Nicholson), a Prizzi hit man, is not quite so honorable, at least where affairs of the heart are concerned. While attending a mob wedding, he throws over his longtime sweetheart Maerose Prizzi (Anjelica Huston) in favor of gorgeous Irene Walker (Kathleen Turner). Supposedly a tax consultant, Irene is actually a paid killer like Charley and this endears her to him all the more. But when it turns out that Irene has betrayed the Prizzis, Charley finds himself on the horns of a dilemma: does he kill Irene or marry her Fortuitously, Irene helps Charley make up his mind by attempting to kill him. The film's strongest suit is its matter-of-fact approach to Charley and Irene's profession; in the movie's most memorable scene, the two lovers calmly discuss their dinner plans while disposing of the corpse of their latest victim. Nominated for eight Academy Awards, including Best Picture and Best Director, Prizzi's Honor won Best Supporting Actress for Huston's daughter Anjelica, playing the "art imitates life" role of Nicholson's cast-off girl friend. The win made Anjelica, John, and Walter Huston the only three generations of one family all to win Oscars. --- Hal Erickson This wickedly post-modern gangster film about a dull-witted Mafia hitman who falls for a slightly smarter version of himself is distinguished by the bleakly comic dialogue by Janet Roach, an exquisitely droll performance by Angelica Huston, and an amusingly gravelly-voiced turn by William Hickey as a deceptively vicious don. Based on an irony-rich novel by Richard Condon (The Manchurian Candidate), Prizzi's Honor was craftily directed by Hollywood veteran John Huston and lusciously photographed by Andrej Bartkowiak. The movie so charms us that we almost forget that these are mobsters whose livelihood depends on others' misfortune, a point cleverly driven home when the married mobsters are hired to kill each other. Jack Nicholson alternately hams and charms his way through the role, while Kathleen Turner is in fine full-throated form as the noir-ish femme fatale. The film carries a subversive subtext about American business practices that hints at Condon's and Huston's deeper purpose, but it is so well disguised by Huston's light touch with the dark material that Prizzi's Honor effortlessly transcends its sinister undertones. --- Dan Jardine Thanks for Visiting DaDon's Rare LaserDiscs ! Reviews, Articles, Newsletter and Information for Movies on LaserDisc LD Laser Disc, LazerDisc.